Hello, I'm thrilled to be a guest designer again this year for Loll's wonderful Twelve Tags of Christmas, and to be opening the proceedings along with Karen Bourke! 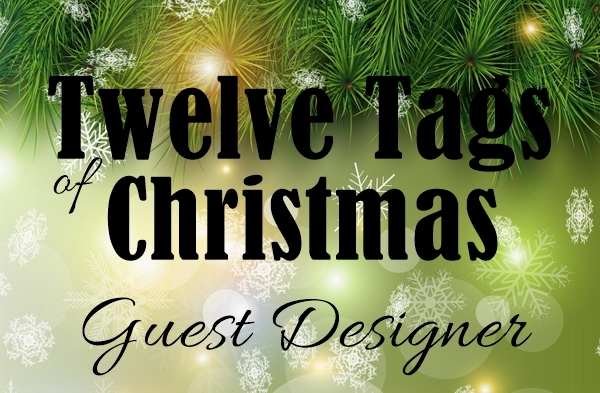 This year, Loll has gathered together even more designers to bring you a double dose of inspiration for your Christmas tags for the next twelve days. Right, let's get this party started! For my tag, I recycled a piece of cardboard, adding a light coating of gesso, Distress Paints and chalk paints to the base, rubbing most of it in with my fingers. I stencilled the numbers with modelling paste and added some dribbles of Distress Crackle Glaze to the upper portion of the tag. The tape is dyed with Distress Inks. The tattered pine cone had its first outing for this tag. It's made from a piece of Core'dinations card, with all the tips folded back and distressed with emery paper. It's nestling on a strip of crumpled muslin, with a few stamens, and a diecut sprig tucked behind it. I sponged the edges of the diecut sprig with Walnut Stain (it's amazing the difference a little sponging round the edges makes! ), then I added Stickles to the edges of the pinecone and a bit on the sprig. There was just enough room for a small sentiment at the bottom of the tag. Pop on over to Loll's blog for more inspiration from my fellow guest, Karen, and for information on how you can join in and win some fabulous prizes. And stay tuned to Loll's blog for the next 12 days - I know I will be! Thanks so much for inviting me again, Loll! I'm looking forward to seeing all the wonderful inspiration from my fellow guest designers. This is absolutely gorgeous, Shirley! I love the soft colors and you've added just the right amount of sparkle! Wow, this are absolutely incredible! The cheesecloth added so much to this and love the texture and subtle glitter on that pine cone! Wow indeed! Love all of the texture and the soft colours. And your pine cone looks amazing! Totally amazing! I adore your natural colours and the pine cones look real! Stunning! Love the soft, dreamy colors of this tag and all the wonderful textures and dimension! Wow! OMG Shirley, what a joy to read thru your very detailed description of your soft and beautiful very textured Mixed Media Tag. Wow....what a beauty and I LOVE the softness of your colors. TFS my friend. Super gorgeous tag, Shirley!! I'm loving the recycled cardboard! LOVE it!! WOW! A stunning creation! I can't imagine actually giving this away though!!! That being said, the recipient will likely love your tag more than the gift that accompanies the tag! Your tag is just amazing! 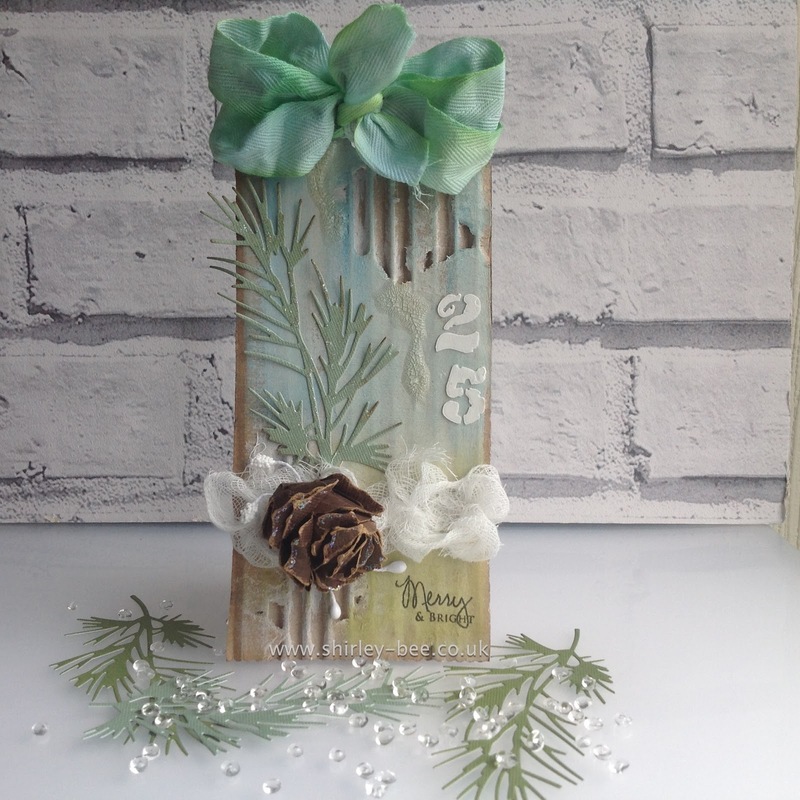 The distressed pine cone is a fabulous addition to the lovely corrugated backing. Love this to pieces! This is absolutely beautiful. the colours are so subtle and gentle and each element complements the others perfectly. What a super gorgeous tag! I can't even pick a favorite item in your tag... it's all perfection.